Cinderella Castle is the gateway to Fantasyland and may be the most photographed castle in the world. It was in place for Walt Disney World's opening in 1971, but construction for the massive structure began 18 months prior to park opening. The concept for the Castle began with actual French castles, as well as artwork from the animated film Cinderella. The castle stands at a towering 189 feet, and its most impressive part may be five large mosaics that tell the story of Cinderella. The castle is home to Cinderella's Royal Table, a wildly popular character restaurant, and the second location of the Bibbidi Bobbidi Boutique, where you can get made up as your favorite princess. Location: The entrance to Fantasyland from Main Street. Open/Close: Opens with the park. Wait Times: As the visual centerpiece to the Magic Kingdom, there isn't a wait, per se, to experience Cinderella Castle. While the large mosaics are inside the castle, traffic flows through here as a means of getting through to Fantasyland, and you should be immediately able to walk up and view them. Of course, the view of the castle is available at any time from the Central Plaza area in front of it. If you do wait, it will be for a random traffic pattern to create a gap for taking the picture you want. Ride Access: This attraction is completely accessible. Wheelchair Transfer: It is not necessary to transfer from your wheelchair or ECV. Audio: There is no audio, other than atmospheric music. At this location: Cinderella Castle has been in this location since the park opened in 1971. 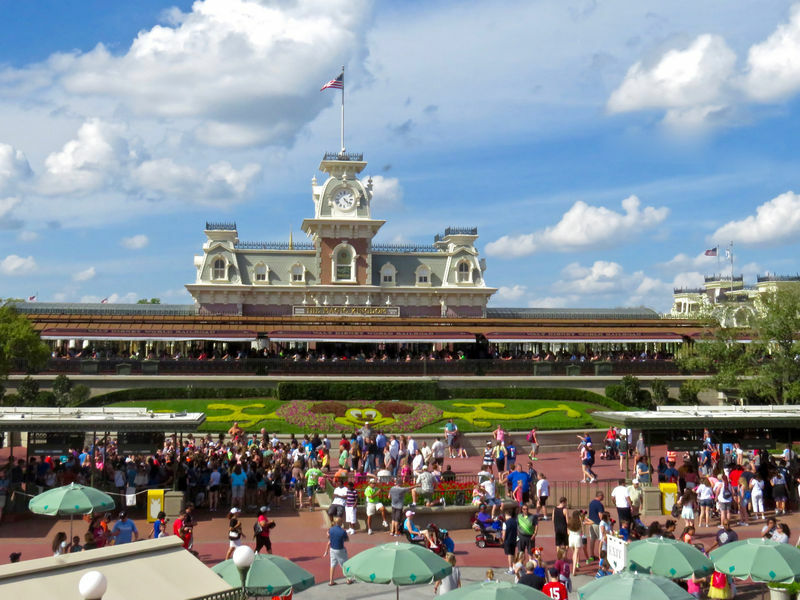 The Attraction's History: The larger amount of room at Magic Kingdom gave the park's designers a chance to dramatically increase the scale of the castle at the center of the park. Designed by Herb Ryman, the castle's design combines that seen in the movie Cinderella with elements of real French castles such as Chambord (link)and Chenonceau(link). To withstand potential hurricane-force winds, Cinderella Castle was constructed with a steel frame and a fiberglass exterior. The five tile mosaics in the walkway through the castle telling the story of Cinderella were designed by Dorothea Redmond and constructed by artist Hann-Joachim Scharff and his team. Construction of the castle took more than 18 months and the tiles were a project of more than two years. Except for one period of infamy, the castle remains essentially unchanged from 1971, though highlights have recently been added for the 2005 celebration of Disneyland's 50th anniversary. The restaurant and store locations were all part of the castle's original construction, though Cinderella's Royal Table was known as King Stefan's Banquet Hall until early 1997. In 1996, the Magic Kingdom celebrated its 25th anniversary and the visual centerpiece was redecorating the castle to look like a giant birthday cake. Painted pink with all kinds of birthday cake add-ons, the new look was not popular among purists (or many other people) and when the anniversary celebration ended in 1998, the castle returned to its original look. Tallest thing at the Magic Kingdom: Cinderella Castle checks in at 189 feet, making it the tallest structure at the Magic Kingdom. An animated TV tie-in? : There are 13 gargoyles carved onto the exterior of Cinderella Castle. Don't lower the drawbridge: Unlike the drawbridge at Sleeping Beauty Castle in Disneyland, Cinderella Castle can not raise its drawbridge. The moat surrounding the castle contains more than 3 million gallons of water. A classic flight: It is now required that Tinkerbell start any Magic Kingdom fireworks show with a flight in front of the castle. She didn't start doing this, however, until July 4, 1985.